William & Mary's new president was inaugurated during the university's 2019 Charter Day ceremony on February 8, 2019, in Kaplan Arena, combining two important moments in the university's history. Katherine A. Rowe, who was sworn in as W&M's 28th president on July 2, spoke at the event along with Robert M. Gates '65, L.H.D. '98. In addition to the inauguration, the ceremony included the re-investiture of Gates as Chancellor of the university. The Board of Visitors unanimously voted in September to reappoint Gates for a seven-year term, beginning July 1, 2019. "As a scholar, educator and an entrepreneur, I am naturally drawn to William & Mary's royal charter for both its history and its vision," Rowe said. "So I’m honored to share my inauguration with the celebration of William & Mary's foundational document. Leading this university's next chapter is exciting and humbling. I'm also looking forward eagerly to honoring our exceptional chancellor, Robert Gates." William & Mary's Board of Visitors voted unanimously on February 20 to elect Rowe as president of the university. 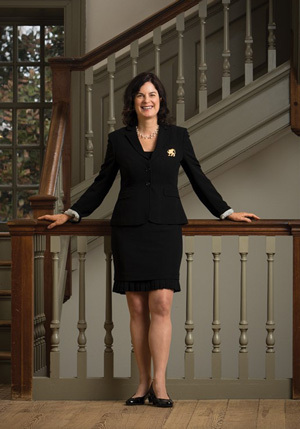 She assumed the role on July 1, becoming the first woman to helm W&M in the university's history. Gates was invested as W&M's 24th Chancellor in 2012, becoming the first alumnus to serve as Chancellor of the university in the modern era.